If unique is what you seek, the Novurania Catamaran 24 Diesel I/O has it all. The CAT 24 I/O is a versatile craft with a twin hull design and inflatable collar. The opening Bow Ramp is operated with the push of a button and fulfills many functions for loading or offloading people and cargo on the beach or into the water. Getting in and out of the vessel requires no climbing with the ramp adjusted to any height. 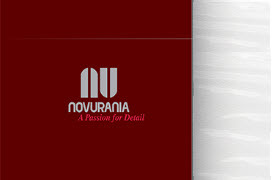 The Novurania Catamaran 24 Diesel I/O is perfect for use by active S.C.U.B.A. divers, island explorers, and physically challenged persons that would otherwise have difficultly climbing over tubes on conventional tenders. The larger Catamaran 24 bow ramp can even safely accommodate wheel chairs and motorized power-chairs. Various deck layouts are available as well, with side or center console and custom seating arrangements. Its low profile and stable, dry ride make the Novurania Catamaran 24 Diesel I/O a unique luxury yacht tender for all types of uses.